Hendrix Aerial Project Feature | Utility Specialists, Inc.
Hendrix Aerial Cable Systems provides quality and reliable systems to communities all over the world. Yes, that means all 7 continents. We come across images of our systems that are incredibly powerful, in so many ways, as each image reflects diverse stories behind them. Businesses (local and large) and citizens who rely on power for so many different reasons continue to be our main focus at the end of every day (and that includes weekends). “We just want to Keep The Lights On” – Bob Biddle, GM of Marmon Utility, LLC. The story below, is just one of many examples that continue to motivate us to exceed all customer expectations and to deliver an excellent, reliable product that can withstand any challenging issues – especially trees. 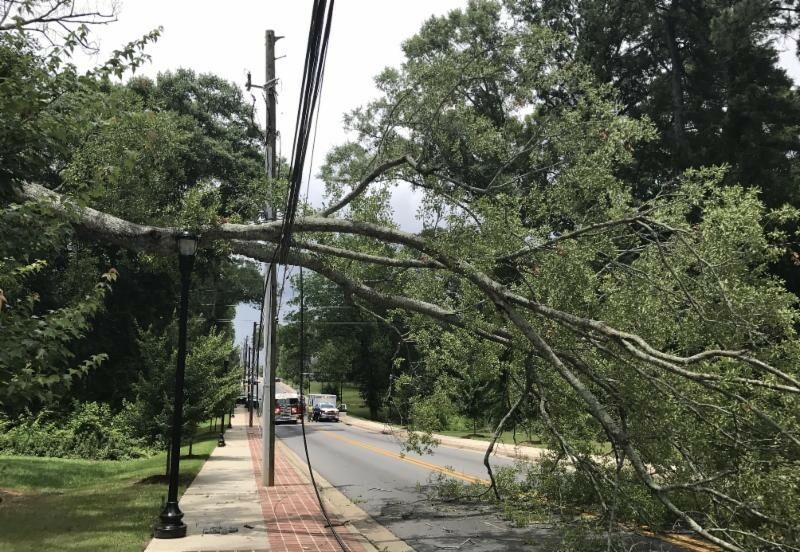 “I recently visited the city of Monroe, GA after hearing that they had a recent outage on a Hendrix line when a tree limb hit the line. This city has many Hendrix circuits, so I was a bit concerned…at first. Before I saw the image (below) I was imagining some small branch hitting the line and causing some unexplained outage… but that simply could not be further from the truth. Half of a very large tree crashed into the circuit with a direct hit on an existing URD tap connection. The messenger was ripped from the adjacent tangent bracket and the tree broke the one phase conductor at the tap connection location. Other than the one broken phase conductor, everything else stayed in the air. The power was out for approximately 3 hours and 2.5 of those hours were spent removing the tree. With a quick splice and new tangent bracket, the city had the line back up and powered again in no time flat. The engineering manager expresses absolutely zero fault on Hendrix’s part and actually believes that the system performed very well.